For visitors not familiar with amateur radio sport (hobie) just a brief information on what this is about. According to the IARU (International Amateur Radio Union) definition an radio amateur is everybody who finds the technology of radio communications interesting enough to spend some free time building the equipment for radio communications and/or making contacts with other people using commercial or home-brewed amateur radio equipment on non-profitable basis. Speaking other way, radio amateurs are usually people spending big amounts of money for enormous antennas, putting them on the roof and making TV interference to their neighbours to disturb them exactly at the moment when watching an important football match. IMPORTANT NOTICE: This is a pure uncommercial site, none of the below presented stuff is being sold neither built nor as a KIT. SVXlink(SM0SVX) interface board for RPi with fully isolated TRX audio and control signal paths integrates an onboard USB sound chip, two audio transformers, optocoupler for squelch detect as well as an optorelay for strong PTT to TRX isolated audio and control signals! 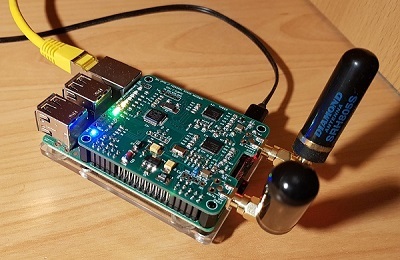 MMDVM MicroRepeater / Dual HotSpot for RPi - type B with an on board integrated 70cm RX SAW bandpass filter. 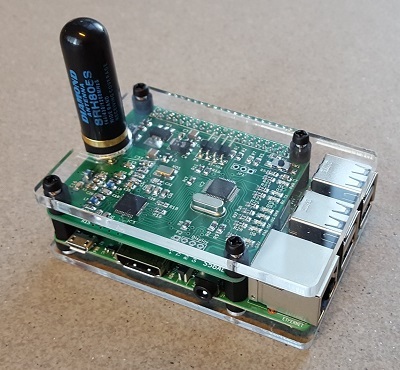 MMDVM HotSpot for RPi - type B The main goal of this project was to design a HS board, that could easily be assembled using just "normal" tools as found in an average equipped amateur electronic workshop. All resistors, capacitors, coils and LEDs used in this project are of the size SMD 0805 or bigger. This should make the assembly of the board much more frendly to a homebuilder who only has access to an average equiped amateur workshop. Furthermore the pads of SMD components are dimensioned in somehow excessive size as well, only to allow more comfortable hand soldering even by a not so experienced builder. Transceiver to PC/SvxLink Echolink GW interface supports hardware based DTMF decoding (MT8870) as well as galvanic isolation of audio and control signals. Download the article (2,3 MB - pdf) and see the details about the SvxLink - Linux based Echolink GW and multi purpose voice services system project by Tobias SM0SVX. The latest PIC16F628 firmware may be downloaded from here (2 kB - zip). The original MS/Windows based Echolink GW communication protocol is NOT supported by this interface. 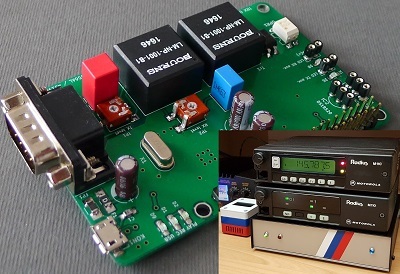 Simple CW identifier for a FM repeater offers external edge triggered as well as internal timer-mode triggered transmission of up to 200 characters long CW message. 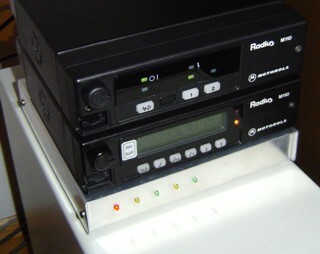 A strong PTT pull-down output and a squelch input offer a simple connection to an existing FM voice repeater, the later also enables a "smart-delayed" message transmission while the conversation is going on. The generated CW tone is a pure 800Hz sine wave with soft edges. 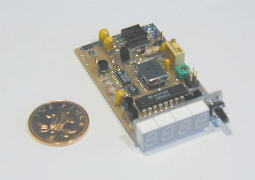 A slightly modified firmware can turn the board into a simple repeater controller. USB adapter za S53MV megabitni TNC (page in Slovenian language only). Adapter služi za priklop S53MV megabitnega TNC na osebni računalnik prek vmesnika USB. V TNC je vgrajen na mestu originalne ploščice RS-232 modula. Vzporedno z USB adapterjem je na tiskanini realiziran tudi klasični RS-232 vmesnik za hitrosti do 115,2 kbps. 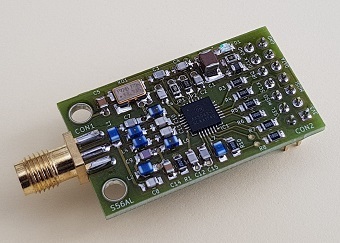 Transceiver to PC soundblaster interface for digital operating modes (PSK-31, RTTY, SSTV,...) with galvanic isolated audio and digital paths. There are 3 types of interfaces presented. One is dedicated to ICOM IC-706, IC-718, IC-746 and IC-756 HF transceivers, the next one suits modern KENWOOD HF RIGs and the third is a simple "PSK-31" interface. The later doesn't support FSK RTTY keying while the other two does. 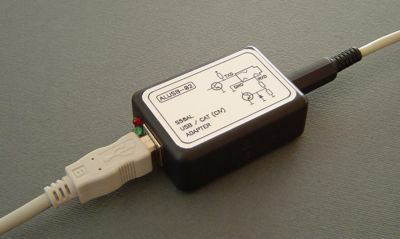 USB / CAT (CI-V) adapter is based on the FTDI's USB / serial IC FT-232BM. The adapter has been successfully tested with the following transceivers and software: VX-7R (VX-7R Commander), FT-8900 (FTB-8900), FT-817 (FT-817 Commander and Ham Radio Deluxe) and IC-706MkIIG (Ham Radio Deluxe). 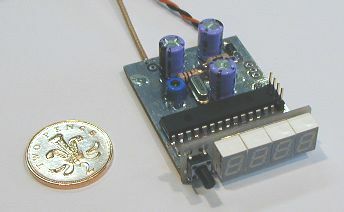 Universal USB digimode interface with galvanic isolated audio and digital paths. Supports CAT (Yaesu), CI/V (Icom) and RS-232 (Kenwood) transceiver control as well as separate PTT and CW keying lines. 1,8MB PDF document requires Acrobat Reader 6.0 or higher. 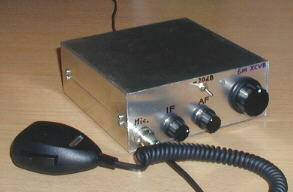 Pocket sized 20m (or 30m) single band 4W CW transceiver with "bullet proof" RX front-end, based on an AD831 mixer. The RX is a single conversion superhet design. With built-in 4 digit LED display f-counter, placed in an appropriate housing, the whole transceiver measures only 95mm x 95mm x 45mm. A stable VCXO covers 10.100 MHz … 10.128 MHz on 30m or 14.000 to 14.085 kHz on 20m. 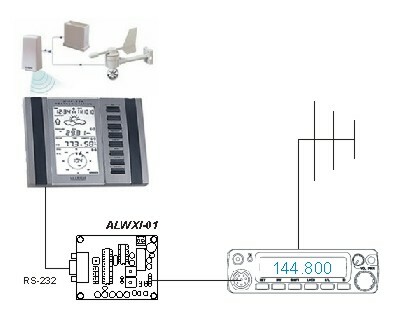 Could be used on 40m or 17m band as well. The headphones on the photo should serve for size comparison. 80m 5W SSB/CW transceiver with 2 x AD831 active mixers and 6 pole quartz ladder filter. Also "bullet proof" J. It has "built in" frequency counter & voltage meter, 6dB & 12dB receiving attenuator, 2W AF amplifier as well as SWR/PWR meter. 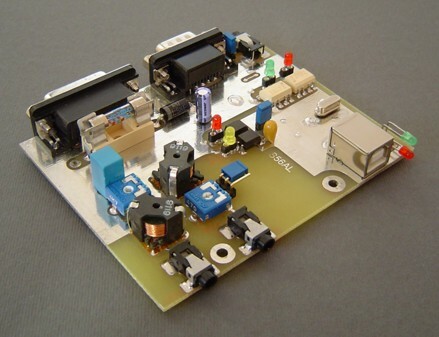 6m SSB/CW transceiver is built around two AD831 mixers with cross-switched VFO and BFO. The VFO is actually a VCXO followed by frequency doubler and covers the 50,000MHz … 50,245MHz portion of the 6m band. 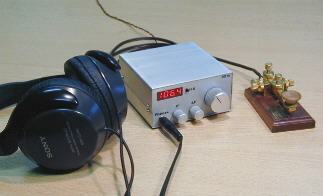 Since the noise figure of an AD831 itself is not acceptable at frond-end on 6m, there is also a BF981 RX preamplifier. I've got more than 10W of output power using a Mitsubishi power block. 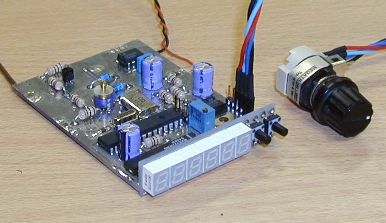 Although not built into the prototype example yet, there is enough space in the 145mm x 150mm x 55mm housing to add a suitable frequency counter. Universal frequency counter & voltage meter with 4 digit LED display is a PIC16C71 based design (small & lovely J). It has a programmable IF offset and switchable frequency display (it can show for example the frequency 10.106.9 MHz in the form of "106.9" or "0.106" or "10.10"). 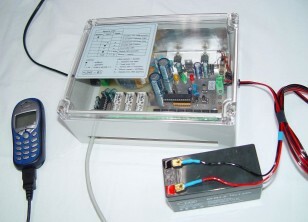 The built-in digital V-meter is useful when operating batterie powered transceivers from the field. Second generation of universal frequency counter & voltage meter The Motorola's MC14499P used as display driver in the first generation of this f-counter (shown on the picture above) seems to be out of production for some time. Therefore I've decided to construct a new version of the counter using more up-to-date components. A single PIC16F876 28 pin device has replaced the PIC16C71 + 93C46 + MC14499P chip-set. The outline dimensions has been reduced and also some additional functionality has been implemented. Modification of a professional 2m VHF FM PMR transceiver Motorola Radius M110 into an amateur radio is a result of a common work of Beno S56KZN and Aleks S56AL.The PMR VHF transceiver Motorola Radius M110 was manufactured by Motorola GmbH therefore being an European radio. 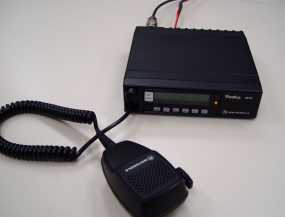 Since many professional radio service users has replaced this transceiver with newer gear, a considerable number of M110 has appeared on HAM flea markets. 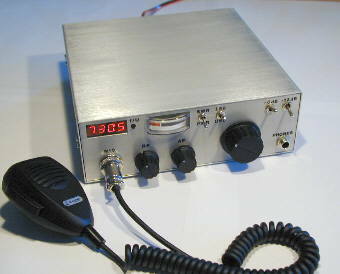 M110 is a simple yet fine mobile transceiver with pretty good receiving performance, detachable front pannel, 10W TX power (depends on the version) and it would be a waste to throw it away or to use it just as a source of electronic components instead of giving it a new life in a HAM shack. GSM SMS javljalnik ALSMS-01 (page in slovenian language). GSM SMS javljalnik ALSMS-01 je naprava namenjena daljinskemu nadzoru objektov, daljinskemu upravljanju električnih naprav, javljanju stanj ter posredovanju informacij z SMS sporočili na enega ali več mobilnih GSM terminalov. Čeprav ALSMS-01 ni čista radioamaterska gradnja, menim, da je za radioamaterje morda zanimiva v aplikaciji daljinskega nadzora objektov na tekmovalnih lokacijah, ki v marsikaterem primeru pretežni del časa samevajo neobiskane in nenadzorovane. DDS / PLL based universal synthesizer has been constructed due to a need for stable, accurate and clean VFO with small tuning steps, able to cover a wider frequency range than a typical VCXO or VCO with tuning diode controlled by ten-turn helipot. Collection of quartz crystal ladder filters used in some of the above designs. They are all built with standard available quartz crystals. Since the price of standard available crystal unit is relatively low and since the experiences show that 6 quartz crystals is just the right number to effectively and radically filter out the opposite side band in a SSB receiver, I mostly use 6 pole filter configuration. 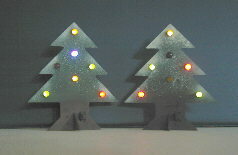 Singing Christmas tree, a non-ham design, but an interesting nice gift for electronic enthusiasts. Simple to built. 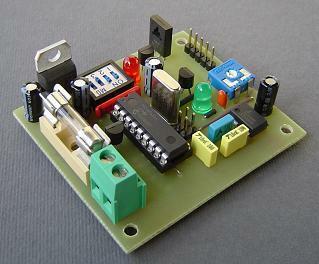 The design is based on a PIC16C84 microcontroller. 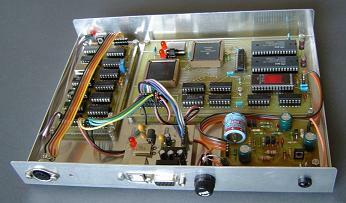 Includes pseudo-random generator to flash 7 LEDs. There are also 8 Christmas & New Year melodies "burned in", similar to those from greetings cards. 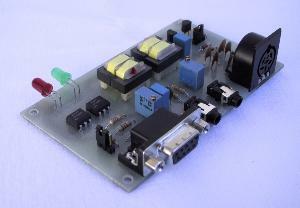 Voltage regulator accepts supply voltages from 5 to 25V. Average currant consumption is less than 10 mA. All components are SMT devices (except voltage regulator, which is TO-92 type), soldered on the back side of the PCB. Some other HAM transceivers designed by S57NAN . Links to other "QRP" or "Homebrewing" related Internet sites. And finally this is the author of the above projects. Go to author's home page to see what are his other activities!